I have been hooked to computing and programming ever since my father bought me a Commodore 64, which was way back in 1983. In 1987, I bought the legendary Amiga 1000 with 512kb RAM, which had tons of signatures and a paw print of Jay Miner's dog on the inside of the top cover! In 1989, I succumbed to Intel and bought a 386/25 PC, which was later followed by a 486/66, and many more PCs. But still, in 1990 I upgraded my Amiga to a 3000 with 6Mb RAM. My last project was the Video Backup System Amiga, which I created together with Rob Langendoen. Rob developed the hardware interface between Amiga and VCR, and I developed the backup software. There is a lot more to say about this product, so please read the Video Backup System page. Before then, I designed and implemented 3D RealTime, a 3D animation package for the Amiga. It has a convenient 3D editor which lets the user design 3D shapes that can be manipulated in real time to create complex animations. 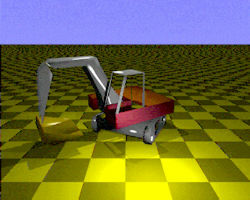 Individual scenes can be exported to raytracing packages for high-quality rendering. For the C64, I designed Music Composer, a program which lets you edit and play musical pieces with up to three voices. The high school I went to has an annual event which consists of a night with all kinds of student performances on stage. In 1986, two friends and I decided to participate and we built a video wall, which was driven by C64s. There were 1 master and 16 slave C64s, connected through a home-grown parallel port network. The computers were synchronized by the master in order for us to be able to use all available voices (3 per computer, 48 in total) for playing music, which we created with Music Composer. As you can see, the screens were stacked in a 4 by 4 matrix to display animations and other visual effects. After the performance, the local newspaper (the Provinciale Zeeuwse Courant) published an article about the show with this picture of our singer and the video wall.